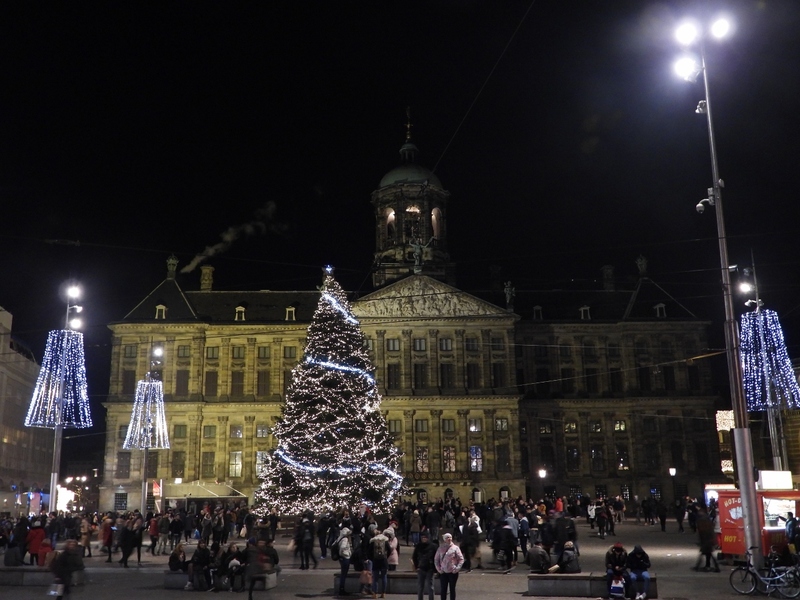 Nieuwe Kerk (New Church) on DAM square in Amsterdam dates back to 1408. That may seem pretty old, but it’s a century newer than Oude Kerk (Old Church). 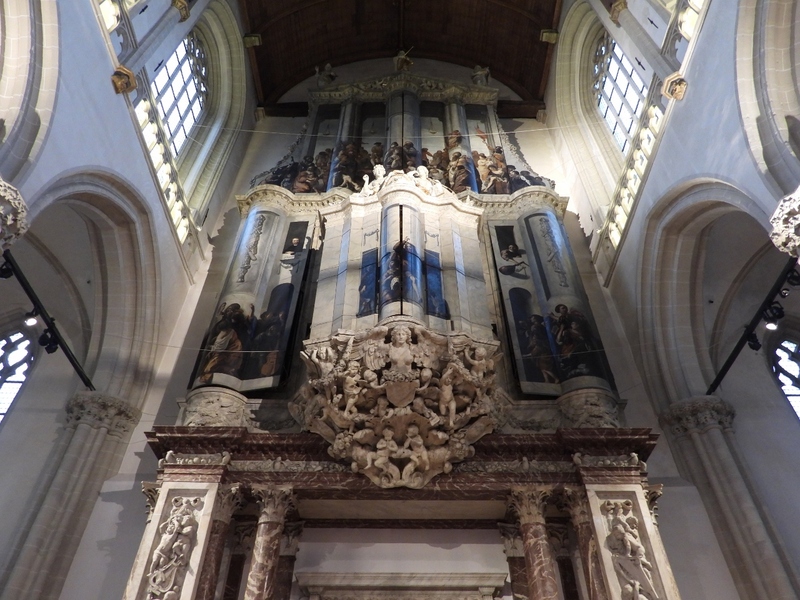 Nieuwe Kerk’s spectacular 17th-century choir screen was the first to be made entirely of brass and its panelled main organ, lavishly decorated with gilding, paintings and statuary, is the largest historic pipe organ in the Netherlands. As part of a walk into town to tour Nieuwe Kerk, we also stopped by Rokin Metro station to view some of the centuries of artifacts uncovered during the nine-year excavation along the Amstel River for the new North-South Metro line and checked out a couple of the Amsterdam Light Festival displays nearby. 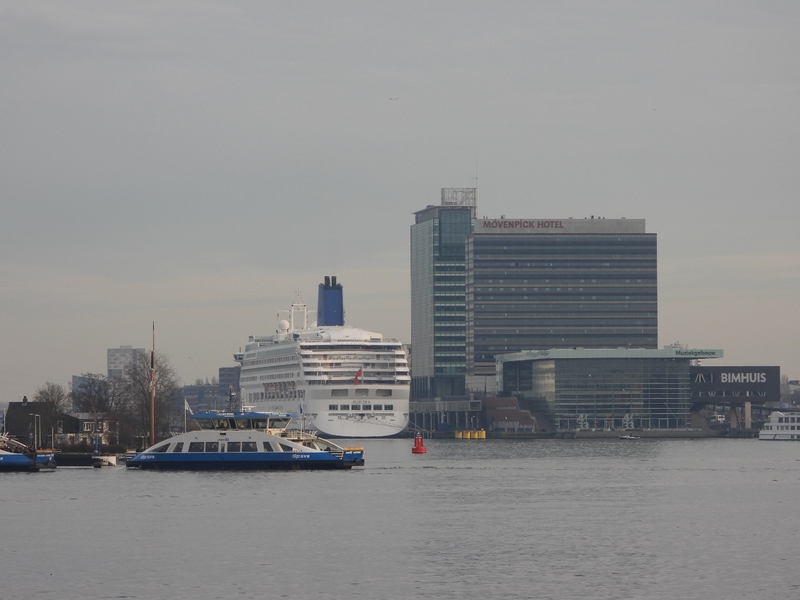 The cruise ship Aurora docked at Amsterdam’s cruise terminal. 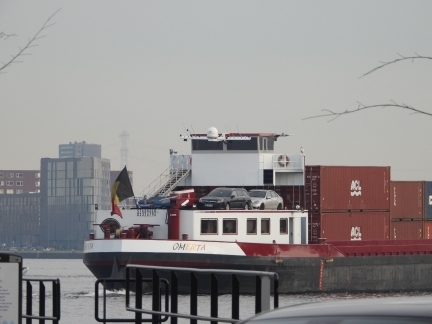 Those big ships really fill the waterway when they go by. The barge Omerta was carrying two cars, a tender and a lot of containers. 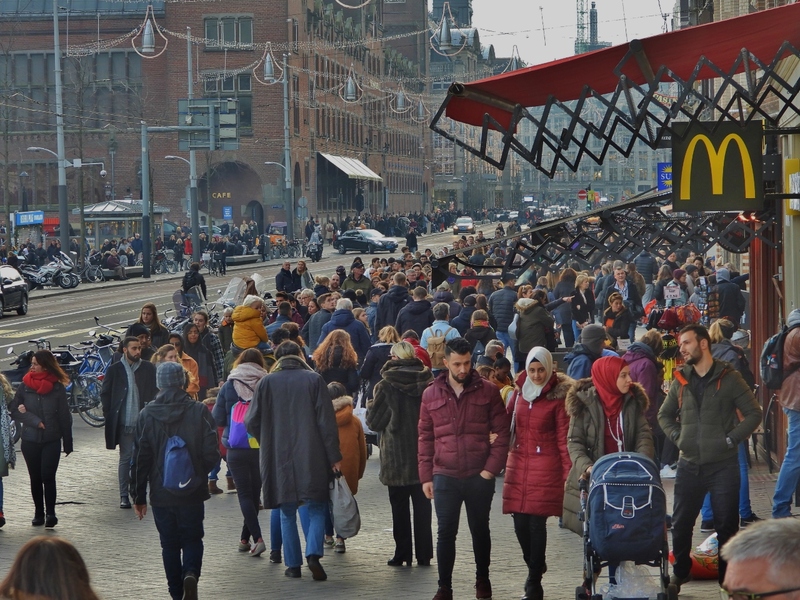 Holiday crowds along Damrak street. 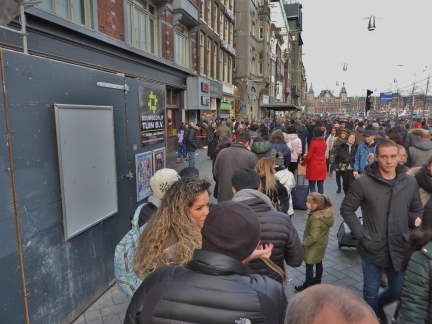 At least forty people were in line for Dutch Fries at legendary Mannekin Pis, “Voted No. 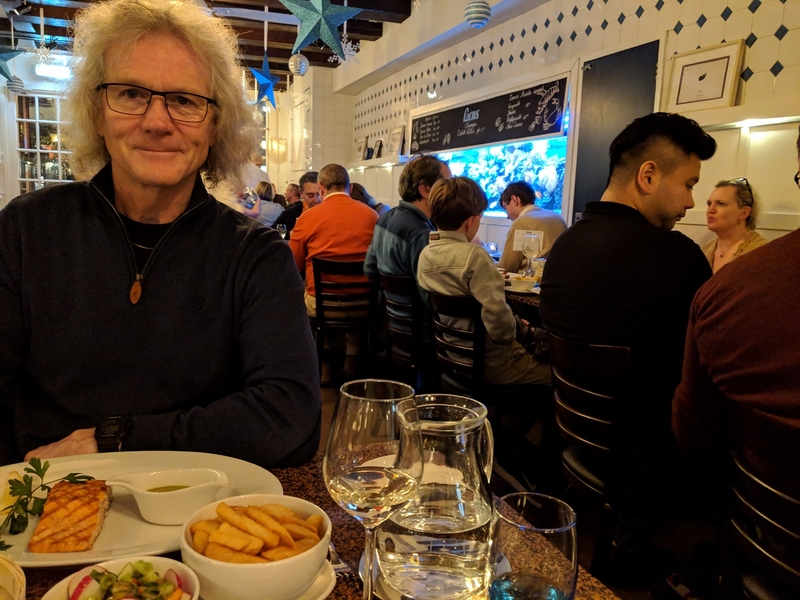 1 Holland Fries”, with many more enjoying the fruits of their wait. The line extends to the awning in the distance—best or not, that’s a long wait just for fries. 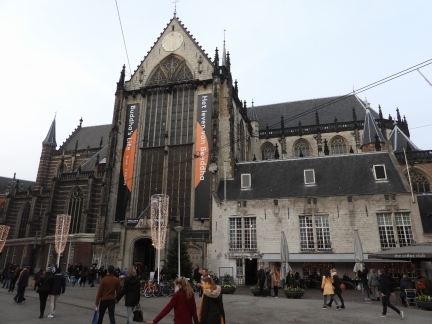 Nieuwe Kerk (New Church) on DAM square dates back to 1408. 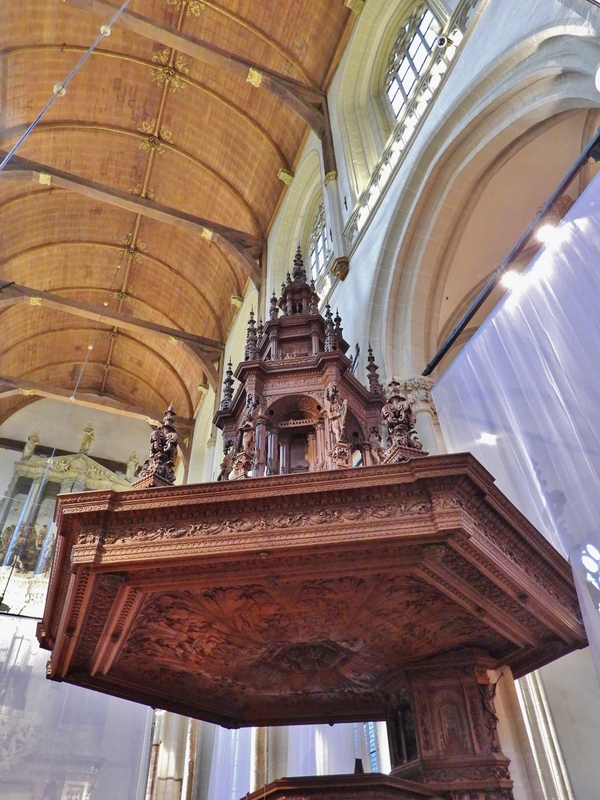 That may seem pretty old, but it’s a century newer than Oude Kerk (Old Church). The traditional place for Dutch royal weddings and coronations, the building now functions as an exhibit gallery. The spectacular 17th-century choir screen in Nieuwe Kerk was the first to be made entirely of brass. 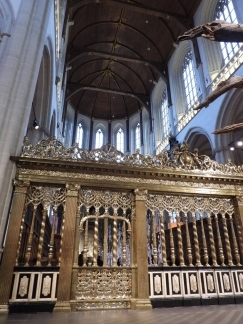 The panelled main organ in Nieuwe Kerk is lavishly decorated with gilding, paintings and statuary. Dating from 1645, it is the largest historic pipe organ in the Netherlands. 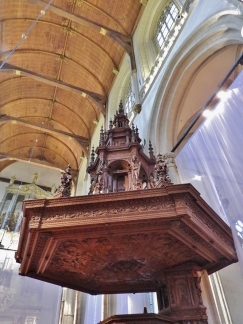 The ornately-carved pulpit in Nieuwe Kerk is 13m high. The main organ is just visible behind on the left. 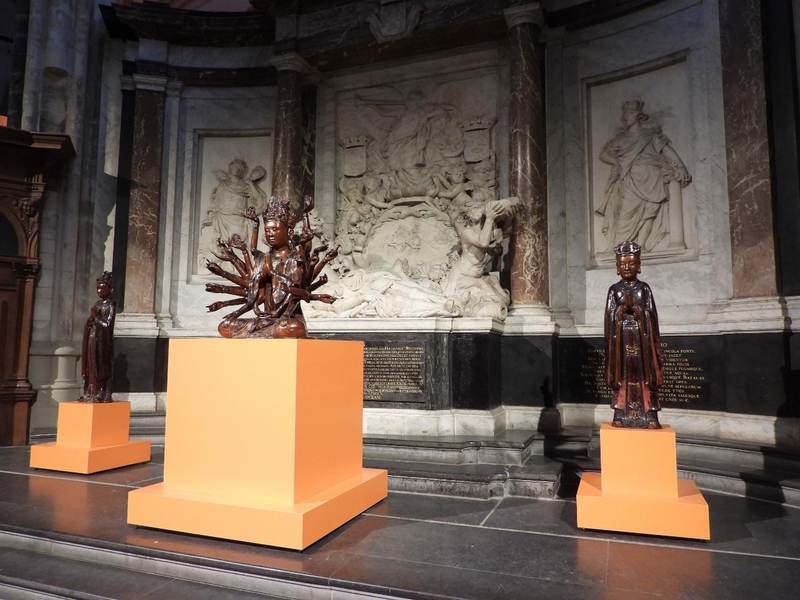 Some of the great Dutch naval heroes are buried in Nieuwe Kerk. This is a memorial to Michiel de Ruyter, considered the greatest of them all. The museum is currently holding a exhibition on Buddha, part of which is visible in the foreground. Yoko Ono’s Three Mounds work in Nieuwe Kerk represents violence against women with dirt taken from countries where suffering has occurred. 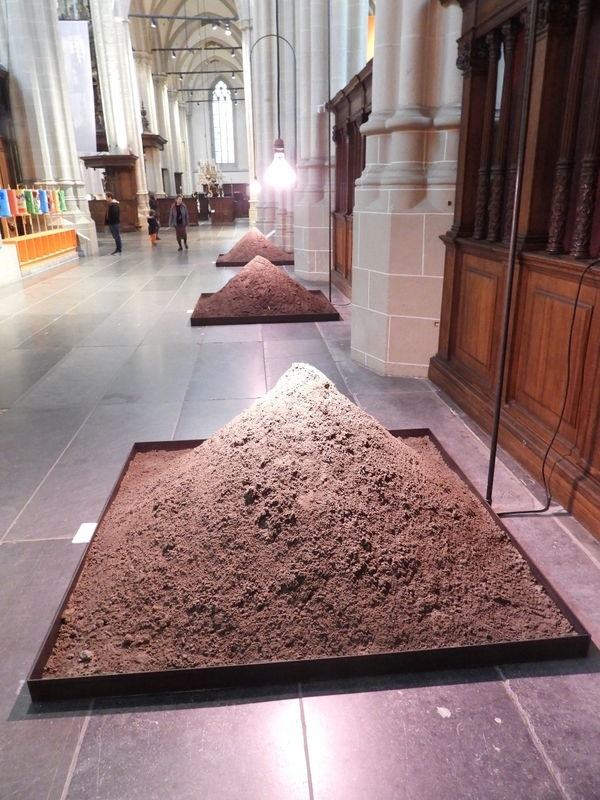 It really is just three piles of dirt. 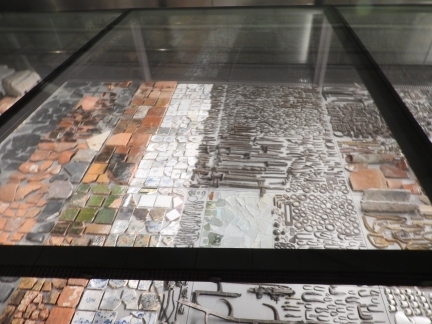 Centuries of artifacts were uncovered during the nine-year excavation along the Amstel River for the new North-South Metro line. The web site Below the Surface features some 19,000 of the more than more than 700,000 items discovered, and a subset of these have been put in display beside the two escalators at Rokin Station, not far from DAM square. 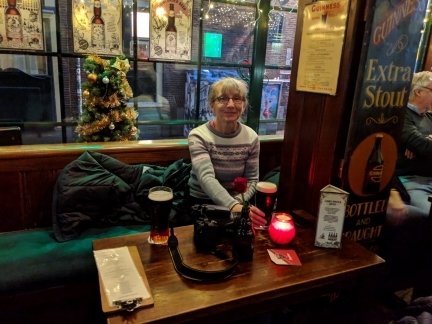 Irish pints, a Guinness and a Kilkenny, at the Irish pub Temple Bar. The establishment likely names after Dublin’s popular Temple Bar district. 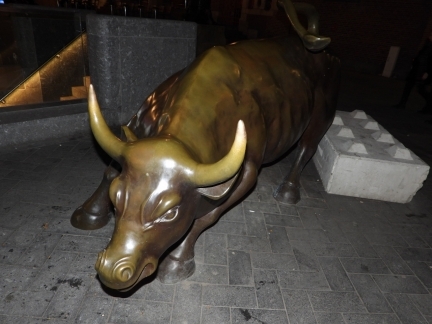 Bull statue outside Euronext Amsterdam, formed from the merger in 2000 of the Amsterdam, Brussels and Paris stock exchanges. 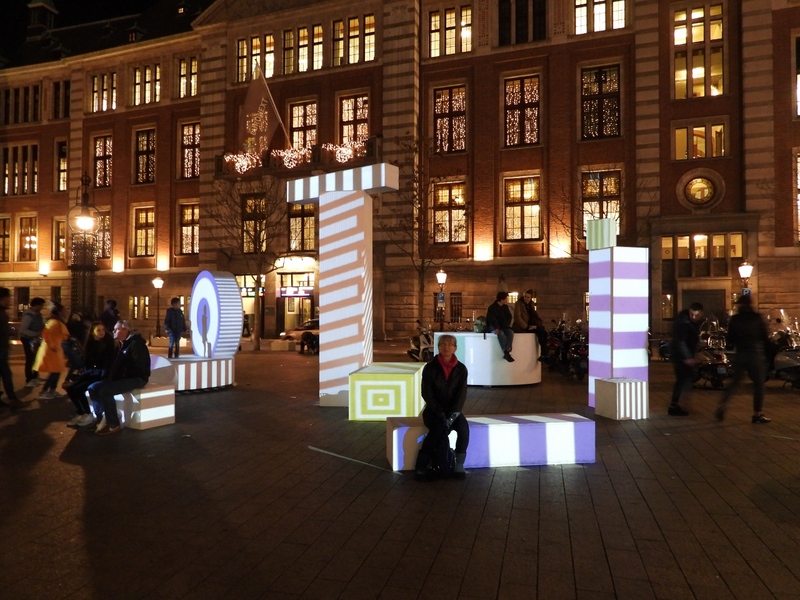 Jennifer perched on Virtual Fairground in the Amsterdam Light Festival. 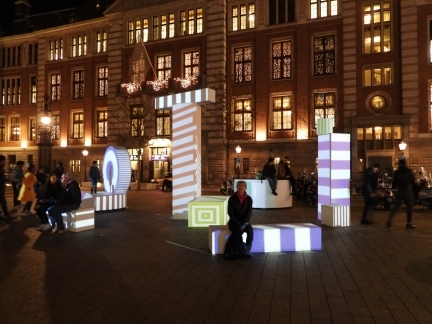 The display evokes amusement park images and refers to how the city can feel a bit like a fairground with all the tourists and crowds. 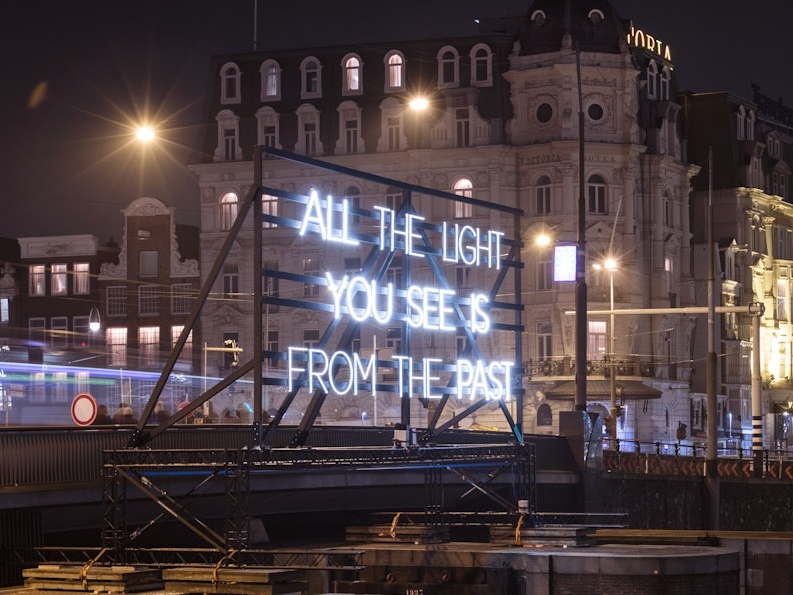 All the Light You See Is From The Past states this Amsterdam Light Festival display. 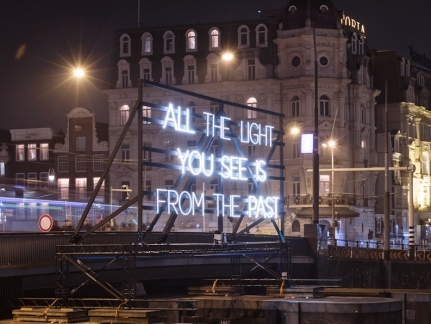 The sign sometimes turns off as a reflection on morality and a reminder that we too will belong to the past. The annual Amsterdam Christmas tree in DAM Square, with the 17th-century Royal Palace behind. An excellent seafood meal at Lucius Visrestaurant with their beautiful saltwater aquarium in the background.